Is a mailing address the same as a physical address? In general, a mailing address can often be the same as a street address, but this is not always the case. To understand why, we must first acknowledge that the two types of addresses are often defined and regulated by two separate authoritative entities that generally serve different purposes. A mailing address, or postal address, is often regulated by postal authorities that are commonly associated with services related to the sending and receiving of mail. For example, in the US this would be USPS. In the United Kingdom, Royal Mail. Deutsche Post DHL Group for Germany and JP Post or Japan Post (日本郵政 Nippon Yūsei) for Japan. These postal authorities can be public government agencies, like the USPS, or privatized companies like Royal Mail, Deutsche Post and JP Post- which were sold off by their governments. A physical address, sometimes referred to as a street address, is used to describe where a place is geographically located. It often pertains to a geographic location under the jurisdiction of an administrative area or region that has some government function. The physical address should have a set geographic boundary that is recognized and governed by an administrative area. If an address resides in an incorporated area then its municipality is generally responsible for providing some public services, such as law enforcement, public schools, sanitation, water works etc. If an address resides in a rural and/or unincorporated area, then sometimes these services are provided by the governing state, territory, province, county etc. Sometimes certain services are not available at all. Where a physical address is geographically located will often determine what public and private services it has access to. For example, a rural address may not have access to readily available public transportation or high-speed internet, whereas an address in a metropolitan area likely would. In the US, it is the job of the US Census Bureau (USCB) to collect and produce data about the people. Both public and private agencies rely on the various datasets produced by the USCB, such as geographic and demographic data, to help make informed decisions. The USCB produces various Topologically Integrated Geographic Encoding and Referencing (TIGER) datasets that are designed for use with Geographic Information Systems (GIS) and various mapping projects. TIGER products are spatial datasets used to describe geographic features such as boundaries, roads, address information, water features, as well as legal and statistical geographic areas. TIGER products are widely used in many US related geolocation solutions, including our own DOTS Address Geocode US service, and are considered a standard when it comes to working with geographic locations and features in the US and its territories. TIGER data, along with other topological geographic mapping datasets, can be used to help geocode a physical address to varying degrees of accuracy. Mailing address datasets are generally used to help facilitate and ensure the delivery of mail, and they are not necessarily one-to-one comparable with geographic datasets like TIGER. The main reason being that these datasets are intended to serve different purposes. Let’s take USPS ZIP Codes for example. USPS ZIP Codes are not geographic areas. They are a collection of mail delivery routes and they help identify individual post offices and delivery stations that are associated with mailing addresses. ZIP Codes help the USPS determine the best route for delivering mail. It is not uncommon for a physical address, that is geographically located in one locality, to be assigned to a different locality in its mailing address. This is common for areas where a single post office or delivery station may serve multiple localities. Here’s an interesting example of an address that is physically or geographically located in one state of the US, but the mailing address has it listed as being in another. 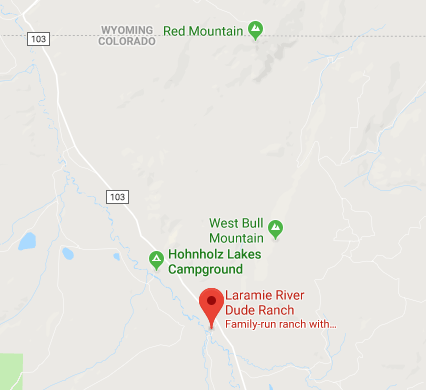 Using Google Maps to inspect the address and the surrounding area, we see that the location is near a state line, but the address is clearly in Colorado and not in Wyoming. According to Google the physical address is approximately six miles from the Wyoming and Colorado state line. When we investigated other addresses in the area we found that they too had a mailing address that said they were in Wyoming. When we reached out to USPS to inquire about the addresses they acknowledged that they were indeed geographically located in Colorado; however, their ZIP code is associated with a USPS Post Office located in Jelm, Wyoming and that is the reason why the mailing addresses are for Jelm, Wyoming and not Jelm, Colorado. It may be confusing to base an address’ location on where it’s post office is located, but logistically it makes sense for the postal authority, USPS. It’s also not uncommon for some rural areas to use general delivery, where mail is not delivered to a recipient’s physical address and it is instead kept at a post office that the recipient will go to and pick it up. If the post office is located in a different locality, then the recipient’s mailing address would be different from their physical address. Post Office Box (PO Box) and Private Mailbox (PMB) – Many individuals and businesses use PO Boxes and Private Mailboxes as an alternative to their physical address. Postal Agencies like UPS offer PMBs as Personal Mailboxes, and while they do advertise that their PMBs include a street address it still is not the recipient’s physical address. Centralized Mailboxes – Also known as cluster mailboxes or community mailboxes, are basically a large communal mail box made up of multiple individual boxes clustered together. The mailing address for a centralized mailing box does not have to reflect the recipient’s physical address as each box in the cluster will have its own unique identifier. Unique ZIP Codes – These are ZIP codes that are assigned to some single high-volume addresses such as universities, government agencies and some large businesses. Postal carriers will deliver mail to the organization’s mail department, and it then delivers the mail to the final destination which may be in an entirely different geographic location. Military Addresses – Are used to route mail for military mail services, such as the US Military Postal Service (MPS), the British Forces Post Office (BFPO) and the German Armed Forces (Feldpost). Civilian postal carriers deliver mail to military post offices which then perform the final delivery. For some people, their physical address is the same as their mailing address and when asked for their address they don’t have to worry about which address to give because they are both the same. For others who don’t have matching mailing and physical addresses, some consideration is needed. If the purpose of the address is to send mail to it, then the mailing address should be given. If the address is needed to locate where a place is geographically located, then the physical address is needed. The answer should be clear but sometimes there are misconceptions and confusion and on the behalf of the party requesting the address. The party asking for the address may simply be unaware that not all mailing addresses are physical addresses and that not all physical address have mailing addresses. If the intent on how an address is to be used is not made clear, then the person giving their address could potentially give the wrong one if the two are not the same. Sometimes the person giving the address will be sure to specifically ask if they want the mailing address or the street address, but the party asking may be unaware of the difference and inadvertently ask for the wrong one. There can also be some confusing cases when it comes to the terms billing address and shipping address. Likely, the billing address will be a mailing address, but what about the shipping address? Let us suppose that a customer wants to have a package delivered to their doorstep. They want to enter their physical address, but they know that USPS does not deliver mail to their physical address. However, they do know that UPS does deliver to their door, but they are not sure about FedEx. If the site they are purchasing from gives them the option to choose the shipping carrier then that helps, but if it doesn’t then which address do they choose to give? Worse yet, what if the customer is unaware that their physical address is undeliverable? When businesses and organizations work with addresses it is important to know where they are located and if they are valid and deliverable. Otherwise, they risk making uninformed decisions that can end up wasting valuable resources like time and money and damaging customer relationships. That is why Service Objects provides various address related products to help prevent mistakes and reduce waste. Our services can quickly correct and standardize address to help determine where they are located and if they are valid and deliverable. Test drive any of our address products with a free trial key and see how we handle these scenarios.